ETN 909W. 1981 Shelvoke Emergency Tender. Tyne & Wear Metropolitan Fire Brigade. Based at Pilgrim Street fire station, Newcastle upon Tyne. Went out of service in 1994. I wonder whether this was really taken in 1981. When this machine was ordered the original plan was for it be located at the small victorian Wallsend fire station. Consequently it was short in length and only had one section after the rear wheel arch. In practice the rear end was found to light so a further section was added complete with an underfloor weight. This meant that the machine was not on the run for at least 12 months from the time of purchase and had to be stationed at the nearby Newcastle East (Fossway) station. It still goes like a rocket and lives with the rest of the 70's, 80's, Fossway appliances. Can Ian (Moore) identify the exact date it returned with the body extension? Added by Barry on 06 January 2008. Hi Barry I'm not sure when the photo was exactly taken, but thanks fro the information very interesting. Paul. Added by Paul Warnock on 07 January 2008. Enquiries are being made to try and establish just when the extension was done, but I do know it was pretty soon after it first entered service. I'm also posting a picture of it in its original state when it was on the run the fossway. Added by Ian Moore on 07 January 2008. Further information to my earlier message on this one, I'm now advised that the appliance was lengthened within about three months of its delivery. Whatever the date, whatever the livery, I await the day you come to your senses Barry and sell this machine to me. Many of you will find it odd that this ET is my favourite all time Fire Engine. That's one of the great things about Fire engines ! It's the memories that makes them special. I sat and rode in this machine as a little boy many times. My father drove this machine to it's first major fire at a factory on Commercial Road in Byker, Newcastle. On another shout, he drove it so fast around Manors roundabout that it was on 2 wheels. Apparently fire fighters often chat on the way to a fire. Whilst on 2 wheels, however, the cab was silent. Once back on all four, the Officer in charge calmly asked my father to slow down. On attendance, the crew were extremely eager to rush in to the relative safety of a burning building !! Paul, great photos, do you have any more of ETN909W, STY31S, EBB783C and A726BTY ? Added by Mark on 07 January 2008. Mark, it is certainly the memories which make your favourite machine. As you know it is the predecessor ET to the above that is my favourite all time. This ET is an absolute jet. The first time out with it I went through some road works which had a chicane type entrance delineated by road cones. I 'wagged' the back end and sent a cone flying. What fun! Added by Barry on 07 January 2008. Added by Peter Williams on 09 January 2008. It looks a lot like the box it came in. But I really liked its Dennis predecessor, especially in its original livery! 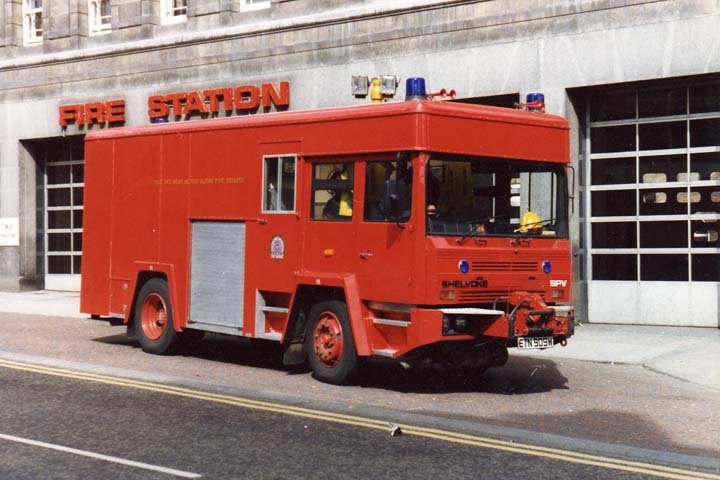 This short wheelbase S&D SPV fire appliance chassis was designed (in a hurry)for a weight distribution which included a 300 gallon tank above the rear axle and a 50 foot Merryweather steel escape ladder hung on the back, originally to compete with Dennis for the big London Fire Brigade order. No surprise that - with a center aisle ET body and a short rear overhang - the rear axle load was way below its design weight. Two wheeling around is very close to tipping over sideways, but the body builder should have cured this problem before delivering the vehicle! Added by Rob Johnson on 09 April 2019.